Professional poker players like Daniel Negreanu have claimed that bluffing isn’t an essential requisite for poker. There are plenty of pro’s who believe they are capable of remaining profitable without a having to bluff a hand. Should I Bluff in Poker for the Hell of It? No. You shouldn’t ever enter a hand with the sole intention of bluffing it because although you might think you’re better than you’re opponent or capable or making him fold, there’s more to bluffing then jut having the guts to do it. Profitable bluffs require a mixture of factors including table position, folding equity, pot-value, flop textures etc. Basically unless you can take all these conditions into account bluffing for the hell of it will be negative value. You’ll lose money doing it and you’ll gain a bad reputation as a “fish” to your friends. Most players probably think they should bluff whenever they sense weakeness in their opponent, or if the pot is worth stealing. However if you bluff too often you’ll develop an image as a wreckless player and inevitably you’ll start getting called too often to the point your bluffs are costing you money. An important condition for bluffs is beleivability and fold equity (the ability to make an opponent fold). However if you start bluffing too outrageiously your opponents will quickly spot this and start re-raising you, or jamming you all-in, or even worse they might start trapping you with monster holdings (typical TAG strategy). Overall, I’m not saying you should never bluff in poker but I want to point out the dangers of stealing pots too often. What you need is a right “balance”, however this “balance” is different for every table or set of opponents. So really it’s about discovering the right balance with experience and knowledge. Should I Bluff in Poker to Impress Someone? One of the biggest problems in young adolescent players today especially in the students I’ve come across, is the need to show-off or impress their colleagues with the biggest bluff. However this creates lots of problems for players and usually they end up broke with these tactics. Don’t get me wrong, there are plenty of other advantages to be made from creating a loose-agressive table image and stealing lots of pots. But there is a massive difference between big wreckless bluffs and well-timed bluffs, where’ve you’ve actually managed to outplay your opponent. 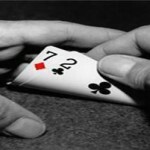 Bluffing in tournaments is an even more importance concept to master than cash games, so to help you in the MTTs I’ve written this excellent guide for Bluffing in Poker Tournaments.